1. Irish saving on airline tickets. 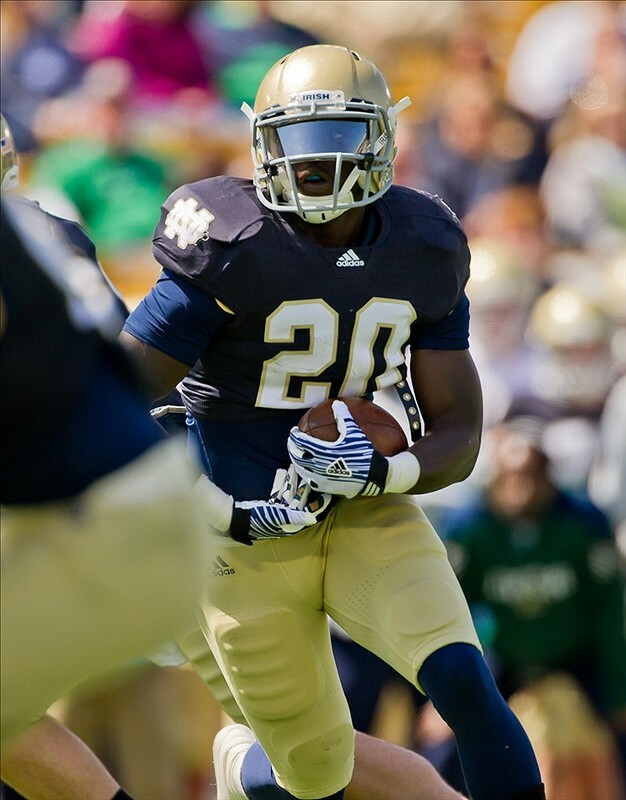 Notre Dame senior running back Cierre Wood, the projected starter for the Irish after topping 1,000 yards on the ground last season, was suspended Sunday for the first two games of 2012, including Saturday’s contest against Navy in Dublin, according to multiple reports. Wood will sit because of unspecified rules violations and will be joined on the sideline by reserve defensive end Justin Utupo, also out for unspecified reasons. But that’s nowhere near the full list. Also suspended for Dublin are quarterback Tommy Rees and linebacker Carlo Calabrese (check No. 7 here), and tight end Alex Welch and cornerback Lo Wood are out with injuries, per the Chicago Tribune report announcing Wood’s suspension. 2. More Navy notes. A feature from The Baltimore Sun on Navy coach Ken Niumatalolo here. A Niumatalolo-heavy season preview from The (Annapolis, Md.) Capital here. The NavySports.com Dublin preview here. To see Navy mascot Bill the Goat have his golden Navy football stolen by leprechauns, click the second video here. If you’re not ready after that … well, we’ll have more later this week. 4. Conference capsules. Our good friends at USA Today weigh in on the Mountain West Conference here, putting the Air Force Falcons in sixth place. SI.com’s Holly Anderson puts them in a tie for fourth, but with a winning record. And USA Today chimes in on the independents here, with very quick hits on Army and Navy.